My family: This includes my wife, my dog, my parents, siblings, etc… My family means a lot to me and I want to make sure I’m focusing on them. My physical health: I want to become a better person physically. I do this through running and some weight workout exercises. If my body gives out, I won’t be much good to anyone. My mental health: I know I can’t focus only on my physical health. My mental health is important as well. This means making sure what I’m putting into my mind is healthy and life-giving. It’s also making sure I deal with anger, depression, and other mental weights as they present themselves (Though I’m not always so good at doing this). My wisdom: I thought about attaching this to the mental health section but this is different from that area of focus. I’m constantly looking at ways to grow my knowledge and wisdom. By growing what I know, I’m better able to share with others when they have a time of need. My finances: Next to infidelity, finances are a major contributor to divorce. Finances can put a huge strain not only on your relationships but on your mental sanity. You’ll constantly be stressed when you don’t know how you’re going to pay your next bill. My relationships: The last couple of years have seen me begin investing heavily in my friendships. These are people who are willing to hold me up and accountable when I’m doing something stupid. We all need friends. Everyone has to decide what the right things are for themselves. I’ve shared what my right things are. You have to decide for yourself. But the following can help you figure out the right things for you. Choose what you want to be remembered for: If you don’t know how you want to be remembered, you won’t know what you need to do to get there. Figure out what you would like someone to say about you at your funeral. Begin choosing the things that would help your friends and family say those things. Choose what you want to do with your free time: Most people feel like their days are gone before they know it. Between soccer games for little Billy to the 8-5 grind to dinner with the family, most of our days have already been decided for us. This doesn’t mean you can’t choose how you spend your free time. Choosing your free time activities can either move you towards or away from your mission in life. Choose to work towards your dream life. Choose who you want in your life: There are people in our lives that aren’t serving us and we’re not serving them. They’ve just languished in our lives (and us in theirs) because it’s how it’s always been. It’s okay to prune people out of your life if you’re in a different stage of life than when you spent time with them. Don’t be afraid to choose who you have in your life. Choose where your money goes: Do you want more freedom than you currently have? If so, begin choosing where your money goes. If you’re not telling your money where to go, you’re going to be struggling with the stress of finances for some time. Instead, choose the better route. Choose where your money goes. Give it a budget and stick to it. Choosing the right things takes time. This also takes focus and intense work. Choose to make time to decide what the right things are in your life and what you need to do to work on them. When you do, you’ll be surprised by how the needle moves in a positive direction. 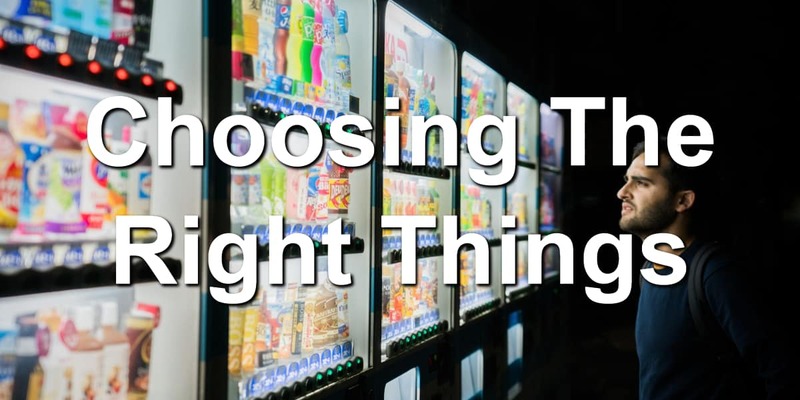 Question: What’s one or two right things you need to choose today? Don’t be shy, share with us in the comment section below.